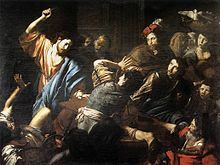 The cleansing of the Temple narrative tells of Jesus expelling the merchants and the money changers from the Temple, and occurs in all four canonical gospels of the New Testament. The scene is a common motif in Christian art. 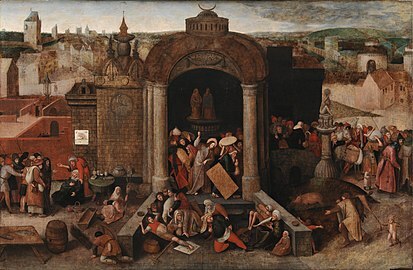 In this account, Jesus and his disciples travel to Jerusalem for Passover, where Jesus expels the merchants and money changers from the Temple, accusing them of turning the Temple into "a den of thieves" through their commercial activities. 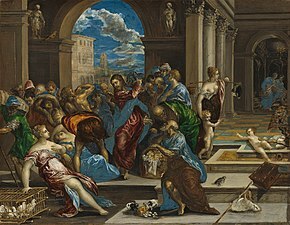 Jesus is stated to have visited the Temple in Jerusalem, where the courtyard is described as being filled with livestock, merchants, and the tables of the money changers, who changed the standard Greek and Roman money for Jewish and Tyrian shekels. Jerusalem was packed with Jews who had come for Passover, perhaps numbering 300,000 to 400,000 pilgrims. And Jesus went into the temple of God, and cast out all them that sold and bought in the temple, and overthrew the tables of the money changers, and the seats of them that sold doves, And said unto them, It is written, My house shall be called the house of prayer; but ye have made it a den of thieves. 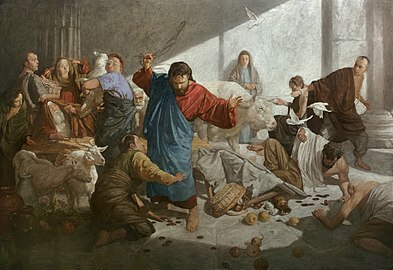 In Mark 12:40 and Luke 20:47 Jesus accused the Temple authorities of thieving and this time he names poor widows as their victims, going on to provide evidence of this in Mark 12:42 and Luke 21:2. Dove sellers were selling doves that were sacrificed by the poor who could not afford grander sacrifices and specifically by women. 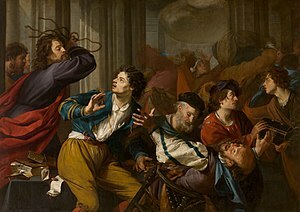 According to Mark 11:16, Jesus then put an embargo on people carrying any merchandise through the Temple—a sanction that would have disrupted all commerce. This occurred in the outermost court of the gentiles. Matthew 21:14–16 says the Temple leaders questioned Jesus if he was aware the children were shouting "Hosanna to the Son of David." Jesus responded by saying "from the lips of children and infants you have ordained praise." This phrase incorporates a phrase from the Psalm 8:2, "from the lips of children and infants," believed by followers to be an admission of divinity by Jesus. There are debates about when the cleansing of the Temple occurred and whether or not there were two separate events. St. Thomas Aquinas and St. Augustine agree that Jesus performed a similar act twice, with the less severe denunciations of the Johannine account (merchants, sellers) occurring early in Jesus's public ministry and the more severe denunciations of the synoptic accounts (thieves, robbers) occurring just before, and indeed expediting, the events of the crucifixion. 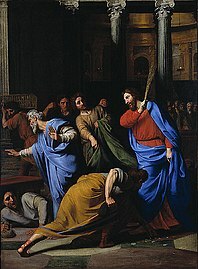 Claims about the Temple cleaning episode in the Gospel of John can be combined with non-biblical historical sources to obtain an estimate of when it occurred. John 2:13 states that Jesus went to the Temple in Jerusalem around the start of his ministry and John 2:20 states that Jesus was told: "Forty and six years was this temple in building, and you want to raise it up in three days?" In the Antiquities of the Jews, first-century historian Flavius Josephus wrote that (Ant 15.380) the temple reconstruction was started by Herod the Great in the 18th year of his reign 22 BC, two years before Augustus arrived in Syria in 20 BC to return the son of Phraates IV and receive in return the spoils and standards of three Roman legions (Ant 15.354). Temple expansion and reconstruction was ongoing, and it was in constant reconstruction until it was destroyed in 70 AD by the Romans. Given that it had taken 46 years of construction to that point, the Temple visit in the Gospel of John has been estimated at any time between 24–29 AD. It is possible that the complex was only a few years completed when the future Emperor Titus destroyed the Temple in 70 AD. Professor David Landry of the University of St. Thomas suggests that "the importance of the episode is signaled by the fact that within a week of this incident, Jesus is dead. Matthew, Mark, and Luke agree that this is the event that functioned as the "trigger" for Jesus' death." 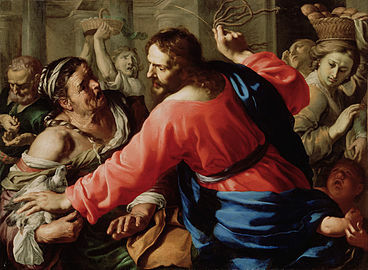 A common interpretation is that Jesus was reacting to the practice of the money changers in routinely cheating the people, but Marvin L. Krier Mich observes that a good deal of money was stored at the temple, where it could be loaned by the wealthy to the poor who were in danger of losing their land to debt. The Temple establishment therefore co-operated with the aristocracy in the exploitation of the poor. One of the first acts of the Jewish Revolt of 66 was the burning of the debt records in the archives. As with other parts of Jesus's story, there are a number of later embellishments to the narrative of the incident that are generally regarded as legendary or polemical by scholars. The Toledot Yeshu, a parody gospel probably first written down about 1,000 years later but possibly dependent on second-century Jewish-Christian gospel if not oral traditions that might go back all the way to the formation of the canonical narratives themselves, claims that Yeshu had entered the Temple with 310 of his followers. That Christ's followers had indeed entered the Temple, and in fact the Holy of Holies, is also claimed by Epiphanius, who claims that James wore the breastplate of the high priest and the high priestly diadem on his head and actually entered the Holy of Holies, and that John the Beloved had become a sacrificing priest who wore the mitre, which was the headdress of the high priest. Yeshu was likewise accused of robbing the shem hamphorash, the 'secret name of god' from the Holy of Holies, in the Toledot Yeshu. He [Demas] made attacks upon the rich, but was good to the poor…And he set his hand to robbing the multitude of the Jews, and stole the law itself in Jerusalem, … And to Caiaphas and the multitude of the Jews it was not a Passover, but it was a great mourning to them, on account of the plundering of the sanctuary by the robber … Judas says to the Jews: Come, let us hold a council; for perhaps it was not the robber that stole the law, but Jesus himself, and I accuse him. 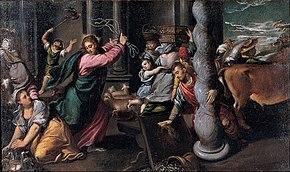 The cleansing of the Temple is a commonly depicted event in the Life of Christ, under various titles. ^ a b Sanders, E. P. The Historical Figure of Jesus. Penguin, 1993. ^ Funk, Robert W. and the Jesus Seminar. The Acts of Jesus: The Search for the Authentic Deeds of Jesus. HarperSanFrancisco. 1998. ^ As stated by Köstenberger & Kellum (page 114) there is some uncertainty about how Josephus referred to and computed dates, hence various scholars arrive at slightly different dates for the exact date of the start of the Temple construction, varying by a few years in their final estimation of the date of the Temple visit. ^ Eerdmans Dictionary of the Bible, page 246 states that Temple construction never completed, and that the Temple was in constant reconstruction until it was destroyed in 70 AD/CE by the Romans, and states that the 46 years should refers to the actual number of year from the start of the construction. ^ Pope Francis. "Angelus Address: Jesus Cleanses the Temple of Jerusalem". Zenit, March 4, 2018. Translated from the Italian by Virginia M. Forrester. ^ Price, Robert (2003) The Incredible Shrinking Son of Man, p. 40. ^ Alexander, P. 'Jesus and his Mother in the Jewish Anti-Gospel (the Toledot Yeshu)', in eds. C. Clivaz et al., Infancy Gospels, Tübingen: Mohr Siebeck GmbH & Co. KG, 2011, pp. 588-616. ^ Goldstein, Morris. Jesus in the Jewish Tradition. New York, NY: The Macmillan Company, 1950, p. 152. ^ Bauckham, The Testimony of the Beloved Disciple, p. 45. ^ Eisenman, Robert, Maccabees, Zadokites, Christians, and Qumran: A New Hypothesis of Qumran Origins. Nashville, TN: Grave Distractions Publications, 2013, p. 10. ^ Zindler, Frank R. The Jesus the Jews Never Knew. Cranford, NJ: American Atheist Press, 2003, pp. 318–319, 428–431.